1) Start off with quiz powerpoint where students have to search the pages to win the quiz. Teacher clicks to reveal answers. Maybe do in teams. 2) Next give students worksheet on symbolism of birds to write a summary of what is happening in the novel at that point. 3) Give students the example and sentence starters. Ask them to write (in pairs) a sentence explaining the symbolic use of one of the birds on the worksheet. EXAMPLE:In the novel Private Peaceful, Grandma Wolf starts to wear an ostrich feather in her hat whilst the war in on. The ostrich is a symbol of pride. It is a unique bird and is usually only found in exotic locations. 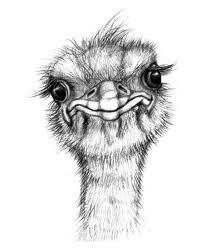 Ostriches are famous for putting their head in the sand which is how they behave when faced with attack. This shows that she is behaving like an ostrich. On the one hand, she is hiding from the attack and on the other, she is continuing on with her imagined life of grandeur when there is war all around affecting everyone else. 4) Students practice using sentence starters so they understand how to write about symbolism in their essays. 5) If students finish early or need extension, they can look up the symbolism of the other birds and try to write their own sentences.